This used to be my favorite sweater but I hadn’t worn it in a few years. When I discovered it hiding in my sweater drawer I decided to wear it out to dinner last night. I put it on and was surprised how short the sleeves were. I couldn’t remember whether they were originally 3/4 length (a stupid style I’ve never understood) or if they just shrunk. The rest of the sweater fit fine so I tried lengthening the sleeves by pulling on them which didn’t create a truly attractive look. One stretched longer and one stretched wider for some reason. It was a cold night and I figured it would mostly be covered with a jacket so I left it on and went off to dine. Within minutes of leaving the house I started itching. First there was a scratchy tag tickling my side. Then it started feeling like a circus of tiny tickle bugs with little claws were dancing around inside the sweater, tickling me everywhere and driving me crazy. I didn’t want to scratch myself constantly so tried raising and lowering my shoulders which sort of rubbed the sweater against me and was better than doing nothing. I couldn’t wait to get home. Fortunately, after a short postprandial stroll, my dining companion and I parted ways. I pulled that hideous sweater over my head, put on my pajamas and hung the sweater over my drawing table for its good-bye painting and a little illustration of those pesky (usually invisible) sweater tickle bugs dancing around as they do. Then I put it in the to-be-donated bag. I’m not sure whether donating it is a kindness or a crime. You paint the picture of your evening so well! It’s so funny but it can’t have been funny at the time! I’ve given up wearing wool now and get (fewer) cashmere things instead – polo necks were especially irritating! Isn’t it a reaction to lanolin in wool that causes the reaction? A woman I know buys old wool sweaters from thrift stores and felts them in hot water and on a hot dryer setting. Then she cuts them into blocks and sews them together to create new felted wood garments which are delightful… and no longer itchy! 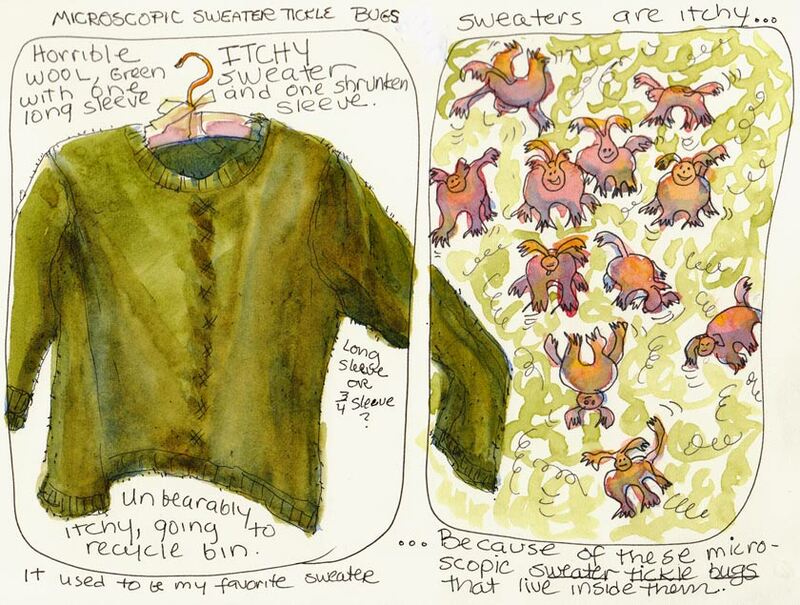 Ah Jana, thank you for the heartily laugh you gave me this evening – this sketch of your ichty bugs and the sweater and the story behind it – adorable!!! Merry Christmas and hopefully you’ll a get new one! You make me laugh out loud. Great painting of those “tickle bugs” – now I know who to blame! take the Tickle Bugs too long to chew through and they’ll take a nap, instead. Too funny! I wonder if the tickle bugs can be tamed. (They look a little like they are tricksters instead of truly vile.) I have a few in a sweater that I want to wear and love because of the colors. Hey, I like the idea of shrinking it and making it into something else. The color in the painting is beautiful. Oh that’s so funny, but being itchy really ain’t so. Pass it on, hey I can imagine someone in an op shop being delighted buying a new garment, then the next day, itchy and scratchy takes over. Not a kindness passed on at all! I’m so glad to know what those tickle bugs in sweaters look like. Now maybe I can make friends with them!